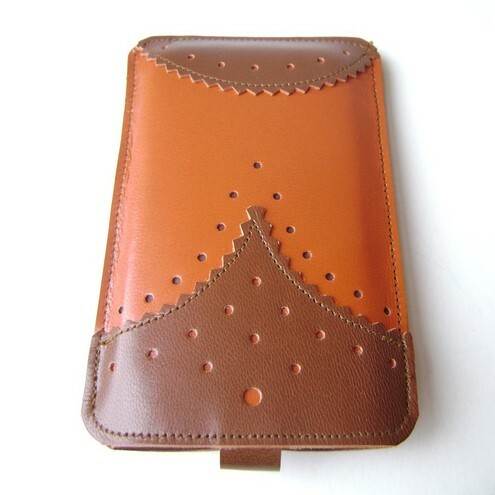 Folksy :: Buy "Leather iPhone / iTouch case - Brogue two-tone"
Brogue is a classic style - a very smart and functional case, perfect for guys and girls! This two-tone case is handmade of durable Buffalo leather, it is also stitched with tough nylon thread. It has a *(new)* strap that will keep your loved iPhone/iTouch in place and it is lined using beautiful soft leather to protect your iPhone/iTouch from the inside. Made of 100% beautiful leather. Folksy :: Buy "Leather iPhone / iTouch case - Brogue "
Folksy :: Buy "Leather iphone/itouch case"
Folksy :: Buy "Leather iPhone/iTouch/HTC(desire&mozart) case - Owl in bloom"